My giant pumpkin growing efforts have been less than stellar this year. Work has been very busy and putting in the irrigation and landscaping for the backyard have taken an immense amount of time and the plants have suffered for it. I've been doing the basics, but not as soon as I should be and the little details aren't getting done. Looks like the pumpkin (Uncle Same) is set on the 2145 plant. Vine growth on that plant I noticed lately has been slower than it should, so recently I've been applying more nitrogen and increasing the watering. For example, today I gave the plants some blood meal. Yesterday I gave the plants some ammonium sulfate and potassium. 1974 plant continues to grow descent, but maybe a little slower, so I've been doing the same nitrogen regiment with extra water for it lately as well. The pumpkin (Grandpa Dee) is growing okay on this one, but not great. Nice and shiny however, so it is in good shape. Weather hasn't been great this year. I'm not sure we've had an overnight low above 49 degrees so far this year. Highs have often been in the 90s and winds have been strong. 30 mph winds yesterday for example. I'm hoping to have the backyard landscaping completely done in the next week and then I can start focusing on pumpkins again. You can't make up for lost time, but maybe I can salvage the rest of the season some. Hi Jamie!!! My name is Cody Ford, I live in Clermont county Ohio. The locals here decided to do a Giant Pumpkin contest!!! 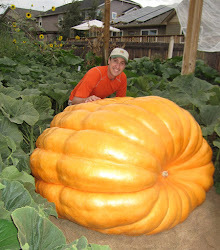 Ive never even seen a giant pumpkin before! So,it kinda intrigued me once I started reading and studying up on them...now, several several several hours of reading and taking notes and watching videos over and over again in the past 2 in a half months,I feel I've only scratched the surface! The seeds that were provided to us aren't proven. There was no info. I self-pollinated bloom at about 20ft-21ft on day 55, July 2. Last night the circumference measured 14 3/4" on day 6. This is my rookie year attempting this astronomical feat! I am already chomping at the bit to find a "proven" seed for next year!! !